Roberto Mancini was sacked by Manchester City on Monday night, precisely 12 months to the day after he delivered the Premier League title to the club in such extraordinary fashion. Manuel Pellegrini, the Malaga manager, is expected to succeed the Italian, with contracts already exchanged between him and City. But though the Chilean is the clear favourite, his appointment is not a foregone conclusion and City are aware that they may face competition with Barcelona among others, amid concerns over Tito Vilanova's health problems. Pellegrini has verbally agreed to take over from Mancini once City exercise a £3.3m clause in his contract with Malaga. Mancini is understood to have been told by Khaldoon al Mubarak on Sunday that he was sacked, with chief executive Ferran Soriano also meeting the Italian face-to-face in London on Monday night before a statement confirming the dismissal was published at 10.30pm. Al-Mubarak called Mancini from Abu Dhabi, having approved the statement which underlined his belief that the close friendship which has developed between the two over the last three-and-half years might continue. The announcement had been delayed as City's board and owners raced to complete the 'review' process of the season, a more complex process than at some clubs, which may have entailed the involvement of Sheikh Mansour bin Zayed al Nahyan. City admitted in the statement they had been forced to accelerate the announcement because of "recent speculation and out of respect to Roberto." They have issued it in time to prevent Mancini going through the humiliation of leading the team at Reading tonight. The statement was significant in its declaration that City now "need to develop a holistic approach to all aspects of football at the club." If appointed, Pellegrini will seek to introduce the same technical football at all levels from youth sides to first XI, as he did at Spanish La Liga side Villarreal, and is expected to be less divisive than Mancini had become. 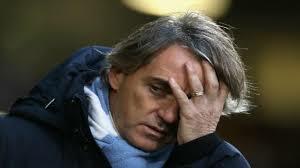 Mancini has been preparing for the possibility of dismissal by the club for some time. The Independent understands that he signed a pre-contract agreement with Monaco after talks about taking over for the 2012/13 season which left the French side confident that he would join them. It is unclear whether that still ties him to move to the Riviera, where his compatriot Claudio Ranieri may be replaced after the club's promotion to the country's top flight. Monaco is his most likely destination. The club are seeking a top bracket manager to match their ambitions after promotion to France's top flight, which has already seem them close in on signing Radamel Falcao. Roma, where Mancini has a good relationship with the general manager Franco Baldini, is a less likely next destination, though Napoli is another possible candidate for Mancini's services. He will be in demand. The future of the assistant Mancini hired, David Platt, and members of his Italian backroom team, will be decided in the coming days. With the Pellegrini discussions on-going, assistant Brian Kidd will lead the team's USA post-season trip next week. It may be next week before the Chilean's appointment is confirmed. It was the leaking of the news about Pellegrini, late on Friday night, which persuaded al-Mubarak to speed up plans to resolve the Mancini issue. The club said on Monday night had met only one of the pre-season targets: qualification for next season's Champions League. The statement said it had been "a difficult decision for the owner, chairman and board" and the "outcome of a planned end of season review process." Al Mubarak added: "Roberto's record speaks for itself, he has clearly secured the love and respect of our fans. He has done as he promised and delivered silverware and success."